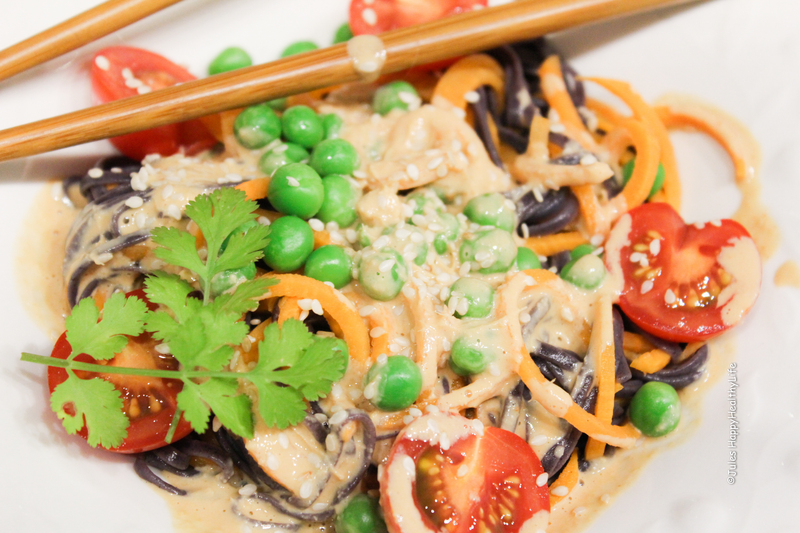 Looking for a quick, delicious pasta recipe, then this Asia Noodles with Tahini Peanut sauce is what you where searching for. I have to admit I do own one or the other kitchen appliance and although some people would certainly disagree with me, they’re all … really all necessary. Certainly some of them I do use more often than others, my Omniblend Mixer was certainly an investment but it is used actually at least once a day. About my food mill perhaps one could argue, but if I make tomato soup, then I need it. I think soon it will be time to find more space in my kitchen. That is the other thing, I hate if too many things are standing around. I believe most people think their kitchen has not enough space. The sauce is so fast and easy to prepare I bet you will not only use it for this dish. The Tahini Peanut Sauce fits perfectly to chicken as well. One reason could be that I have most of the ingredients for this dish almost always available. Guess you can tell it is one of my favorite dishes. Certainly it is easy and fast and you really only need a larger pot for cooking, plus a mixer, okay and possibly a spiralizer. I can really recommend to invest in a spiralizer, especially when you live like me gluten-free or simply want to eat less carbohydrates. Further “Zoodles” – the official name for vegetable pasta, noodles is cooked much faster then most other pasta. How did I exactly come up with this sauce, I can not remember, probably I have thrown some of my favorite ingredients together in a blender and was thrilled about this result. I’m a huge fan of Asian cuisine, as it is usually very fast, the cooking of the ingredients is kept to a minimum and the flavors are just something special. Unfortunately I have not managed to travel to Asia yet. I plan to do this pretty much every year but somehow always some other destination wins. There are so many beautiful places on earth I would love to see. I believe, everything tastes better with peanuts. Especially in savory dishes Peanuts add this extra crunch that I like. Further you feel a bit like having a treat. Traveling is one of the few things that makes you richer at the end, although you have spent money. My dream still is to win the lottery, I hope this Friday it is going to happen. Then I would travel around the world and experience as many great places to eat as possible and take a lot of cooking classes all around the world like Tuscany or South Africa … we all should have dreams. Instead of peas and tomatoes this dish works also very well with sugar peas, broccoli or Pak Choi. 1/2 Chili or if no chili is available, use some Sriracha. 1 tbsp Tamari – Or soy sauce if you are not gluten free. Peel the sweet potatoes and spiraliz them. In a bigger pot bring water to boil and add the sea salt. Put Tahini, Miso, peanut butter, ginger, Tamari and chili to your mixer and puree until you have a nice smooth sauce. Add the black rice pasta to the boiling water. Be careful the pasta will not take long, only around 6 minutes. Shortly before the pasta is over, add the peas to the water. If they are still frozen, add them a bit earlier, the water will cool down a bit. The water needs to heat up again, then add the sweet potatoes wait until they are also heated then drain everything. You can either poor the sauce directly onto the pasta and peas but if you want the sauce heated just put it in a small pot or what you can do even before is to use hot water when you make the sauce. Serve, add some cilantro if people are into it, as for example me as well as the cherry tomatoes that you have washed and cut in half. You can exchange the vegetables, like use carrots or zucchini instead of sweet potatoes or add mushrooms. Please be creative.